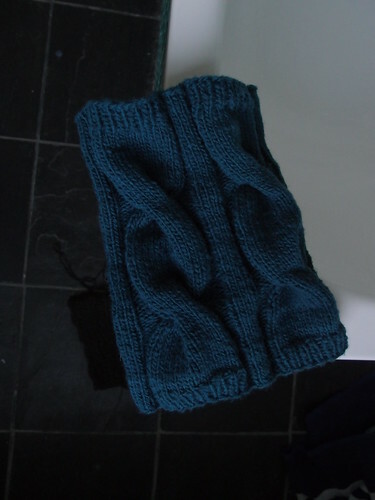 Another nifty unisex gift and an excellent use of Malabrigo, is a textured cowl. 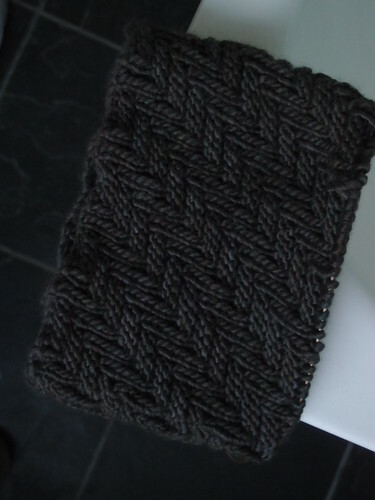 This one is the Darkside Cowl which I made for my brother last Christmas. Only took me a couple of days and it gives a lovely squishy fabric in a manly-looking pattern. Another speedy option (with an equally dodgy photo perched on the edge of my bathtub) is the Scrumptious Neckwarmer. Nothing like a few classic cables to add some interest and help the cowl stay cosy against your neck, this was another gift last year. There are lots to choose from on Ravelry, and one that’s in my queue is the lovely Dry Stone Cowl. I’m slightly despairing of the possibility of knitting it in time for Christmas, given the other projects still on the go, but we live in denial hope!